For more than 150 years, the mission of the Hospital for Special Surgery in New York City has been to provide high-quality, efficient care for orthopedic and rheumatology patients. The hospital performs more than 30,000 surgical procedures a year, including more than 10,000 joint replacements. 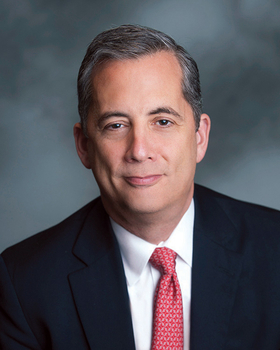 At the helm of the organization since 2006 is Lou Shapiro, a veteran healthcare executive who previously served as chief operating officer of Geisinger Health System in Pennsylvania. Shapiro stopped by Modern Healthcare's Chicago offices to speak with reporter Maria Castellucci about HSS' unique care-delivery approach, its efforts to expand and how to achieve value in healthcare. The following is an edited transcript. MH: What makes HSS' approach unique in the orthopedic and rheumatology landscape? Lou Shapiro:​ There's a concept called Focused Factories where organizations, whether they're in manufacturing or healthcare, whatever they do, they have a great deal of volume in one area. All of their support systems are organized around it and they produce a better result than the same kind of organization that's not focused. HSS has a long history of having that focus and a commitment to excellence that's in the DNA of the organization. Employees, regardless of what role they play, view it as a privilege to be part of HSS and understand the commitment that's required to make HSS able to fulfill its purpose; if you're not fulfilling that purpose, then you have no purpose. It's also about talent. Regardless of the evolution of technology—ranging from robotics to artificial intelligence—in healthcare, for the foreseeable future, technology is an enabler, but it's still people taking care of people. And the ability to recruit and retain people who are the best at what they do in all fields is a driver of success of any organization. A derivative of the Focused Factory and the culture is that everything you do is organized around a patient type. You put all that together, not by accident but by design, and that's when the real definition of value comes to life. Value is a great word, but understanding what it means is even more important. It's used excessively today, but there's a clear formula for it: quality plus service over cost is sort of the baseline equation. Price is what you pay; value is what you get. And as the healthcare industry evolves, distinguishing the difference is really, really hard for everyone. MH: What do you think is needed to make that easier? Shapiro: In general, it's having a common language and a common system of measurement. The way some systems are measured today, you could have two patients who had spine surgery and you could be measuring what it cost and what were the outcomes, and one may be better than the other. But, what if the patient didn't need surgery, that they should have been treated with a nonoperative approach? The systems aren't mature enough to measure that. Only some institutions attract patients for second opinions. So those organizations have a unique view into the industry, because they can see what's happening elsewhere. We had two tools to measure outcomes for hip and knee replacements. But because they're long and complicated, patients weren't filling them out. Our outcomes scientists studied that and developed a way of tracking and measuring outcomes. That was promulgated because it was studied, it was published, and now that's what everyone uses. I think that's what has to happen, sort of from the bottom up. The government's not going to solve our problems for us. The large groups that represent everyone are probably not going to solve our problems for us, not in the way that we need to. But leaders in the industry have an opportunity to rise to the occasion and make a difference. MH: What are your thoughts on bundled payments for joint replacements? Is that moving the needle toward value? At HSS, we participate in bundles programs. But we do that because it's a trend in the industry, and that's what the buyer wants. We were never fragmented, so we've been delivering the value of a bundle regardless of how we've been paid. This notion of volume to value, there's some truth to it, but it's also a little insulting to those that have always been delivering value. I remember sitting around the table with Dr. Don Berwick (former CMS administrator and head of the Institute for Healthcare Improvement) 20 years ago, talking about exactly the same thing with the same passion that we're talking about now. How do we make things better? So bundles are not revolutionary. You can argue about how it's being done and whether it's successful or not, but you can't really argue with the principles of it, right? Access, cost, quality. It's impossible to argue with that. How you do that is a totally different story. MH: Can you talk about this role of the chief value medical officer that you created and why you thought it was important? Shapiro:​ Before the word "value" was prominently used in the literature, we said to ourselves, "We need to do a better job of articulating our value proposition to our key stakeholders," who are our patients, anyone who's involved in receiving care or paying for care. And we specifically said, "Our patients," or consumers and patients, depending on where they are, and "employers, insurance companies." It's harder to communicate with the government, so we didn't really include that, but "Consumers, employers, payers." We not only need to do a better job of being able to articulate our value proposition, we need to figure out ways to improve it, even though we led the industry. We worked at it and worked at it and we got better at communicating it. We continued to make improvements just like we always have, and then we decided that we needed to bring in a physician leader who understands quality and value-just like we have people who are sort of the best and brightest at taking care of people whose back hurts or patients who have osteoarthritis, or patients who have lupus, or whatever. We identified a person who was a quality leader at a major health insurance company, on the faculty of a major university and research company, and happened to have her base specialty in an HSS-related field, rheumatology. She knew a lot about back pain. She knew a lot about osteoarthritis, and she knew a lot about quality and value. So we said that we were going to create a leadership role for her to drive the journey toward improving our value proposition. And she is our chief value medical officer and she leads our Value Management Office, which is a group of data scientists and biostatisticians and quality professionals who study these things and help us figure out what we need to do to communicate and what we need to do to improve. That's all under the banner of the Center for the Advancement of Value of Musculoskeletal Health, which is our commitment to playing a leadership role to promulgate this in academic and innovative ways inside HSS and across the industry. MH: Can you talk about your global efforts to improve quality? Shapiro: We're trying to do two things. One is through an organizational model that we've created called HSS Global Ventures, which is intended to replicate our business model in other geographies, domestically and internationally. We're also advising others that already exist. We do it in Brazil, we do it in South Korea. We call that replication, right? On the other side is how do we help people without it being bricks and mortar? That's innovation-in science and technology, which could be new devices in care delivery. We've had a number of startup companies and licenses that came out of HSS, either independently or in partnership with another organization. One example is a relationship with a German company that is using our knowledge to hopefully develop a new drug for rheumatoid arthritis and lupus. Another organization that grew out of HSS is an artificial intelligence company that will be able to diagnose images accurately without human intervention. HSS has some of the highest patient-satisfaction rates in the country. Our net promoter score is 94%, which is unheard of. We partnered with an outside company to codify the knowledge around how we deliver a great patient experience. A new company was created to do that, and it's working with others. A company in Italy applies additive manufacturing techniques, sort of like 3-D printing, and uses trabecular titanium to make joints in a way that traditional manufacturing can't do. We're no different than anyone else. We get paid for what we do, so we want to figure out how to get paid for what we know, and use that economic foundation to continue to fuel the academic and research mission of the organization in an environment where resources are constrained. That's the approach we're taking.